1. 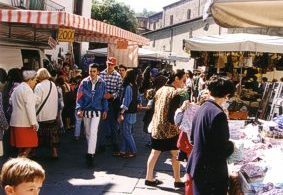 The Thursday market at Castlenuovo di Garfagnana is one of my weekly musts, even after almost three decades of ownership! 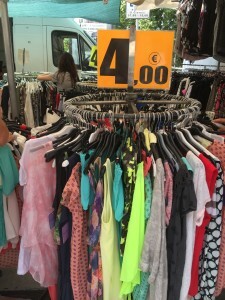 It is very tribal: men talking politics and sport in the square; women rummage in the stalls for cheap fashion and home items. 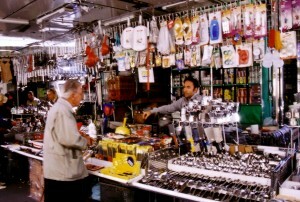 The clothes and shoes are great; the shops and bars are all busy and fun and the fruit and vegetable market is wonderful. Have a coffee or a vino at Andrea Bertucci’s bar Il Vecchio Mulino and savour a piece of the huge mortadella on bread and, if you’re lucky, his mother’s cake “torta squisita”. 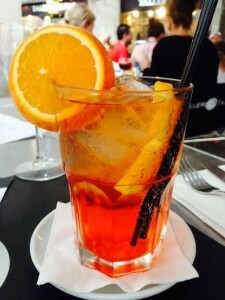 Drink an Aperol Spritz at one of the bars in the lower square at the end of your visit and enjoy watching the crowd. 2. 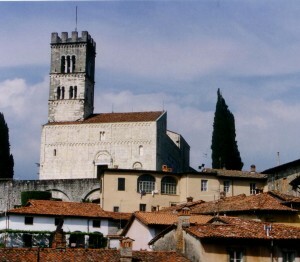 Visit the hilltop town of Barga and the beautiful cathedral of St Anthony with its wonderful windows of alabaster. Go on Saturday morning for the market; take coffee or hot chocolate at the corner bar near the cheese and funghi vendors in the new part of town. Cross the bridge, take the narrow path into the old town and wind your way around until you get to the top or get lost – both are musts for this place! 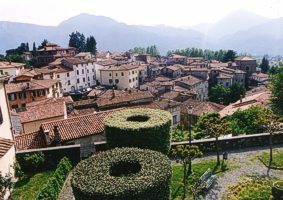 Barga has a number of art galleries and a fabulous little theatre, Il teatro dei differenti. If you can get to a performance in it, do or enjoy the Jazz Festival in summer. 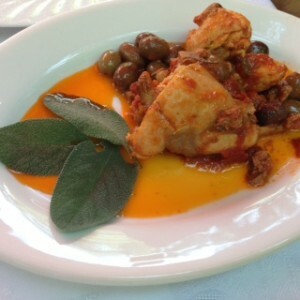 Lunch at Ricardo’s in the square and order a selection of their small plates for a big taste sensation. 3. Local food. 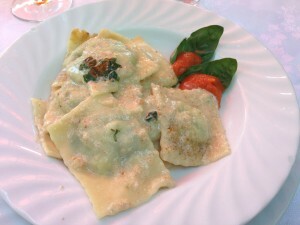 Enjoy lunch or dinner at Il Pozzo at Pieve Fosciana – a gastronomic delight with Slow Food proponent Giordano and his team. Extraordinary food at very reasonable prices. 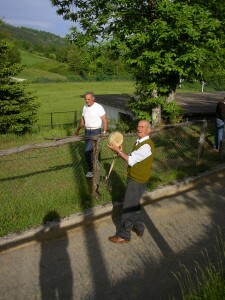 It is on the way in to Castlenuovo. 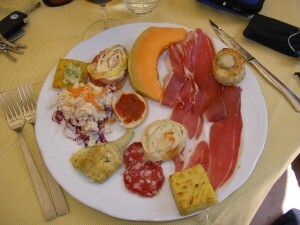 Their plate of antipasto is mouthwatering. 4. 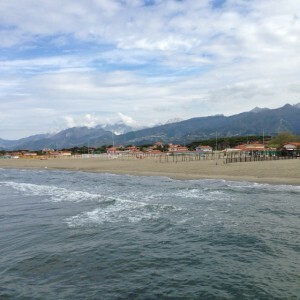 The summer Sunday market at Forte dei Marmi. Sunday morning is a perfect time to visit the elegant Versillian coast for its market. It is a shopper’s delight or a visual delight if you sit at one of the bars on the pedestrian street and watch the glamorous Italians at play. If you don’t mind a drive to lunch then head north to Bocca di Magra for lunch at Ciccio, another gastronomic treat offering exquisite seafood. 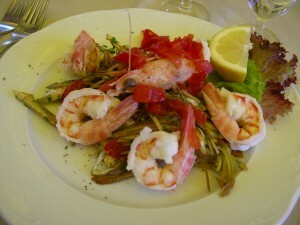 Drink the house white, a Vernaccia which is perfect with fish. 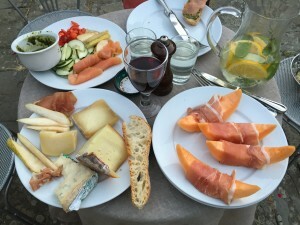 And definitely don’t leave until you have finished the meal with the owner’s home grown and homemade limoncello. You should book. It is indeed a treat. Drive home via Sarzana for a gelato. 5. A late afternoon walk to Orzaglia the ancient hamlet just below the villa. Unlike the old Caprignana this was not damaged by the 1920 earthquake and remains as it was built many years ago. If the tiny church in the main square is open peek inside, it tells much of the life of this place. If you are comfortable in a cemetery, visit the small and very lovely village one on the walk down. I always pay homage to those who walked these roads before me. 6. 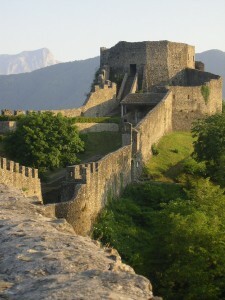 Climb the hill to the fortress at Verrucole on your last night with a bottle or two of bubbly and some nibbles. You’ve been looking at it from the terrace since you arrived; now it’s time to give thanks for your fabulous time here from this ancient monument. 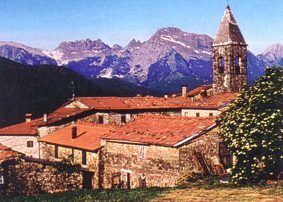 Hours of opening are posted in the village below the fort. 7. 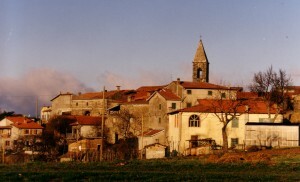 Drive up into the huge national park of Orecchiella above the village. 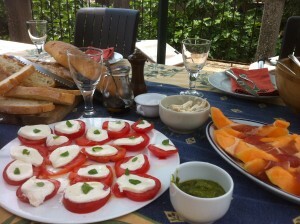 Go to Corfino, arrive at 1pm and have lunch in the garden at La Baita. Tell them you are from Caprignana and send regards from Buzz, please. 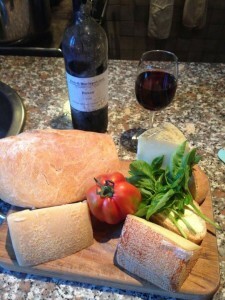 It is family run for the past 42 years and offers superb local fresh food made on the premises with love. Try Roberto’s homemade raspberry liqueur after the meal. 8. 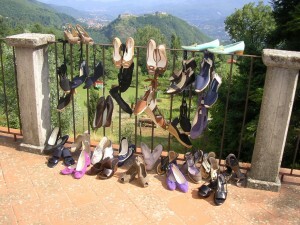 Buy some shoes from Roberta in “shoe street” in Castlenuovo. Ask for Nadia who is English and tell her Buzz sent you if you want a discount– she’ll give it with a big smile and we can guarantee you will never find anyone who will work so hard to find you what you want. The photo below was from a group a few years ago. 9. Eat and drink at home. 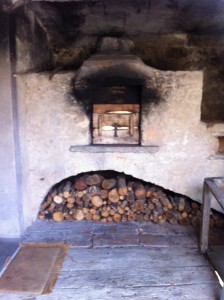 Use the forno to cook up a storm. Burn some wood until the roof is white, then put in your dishes and close the door. Open wine. Wait. Look. Open more wine. Eventually it will be ready and superb! 10. 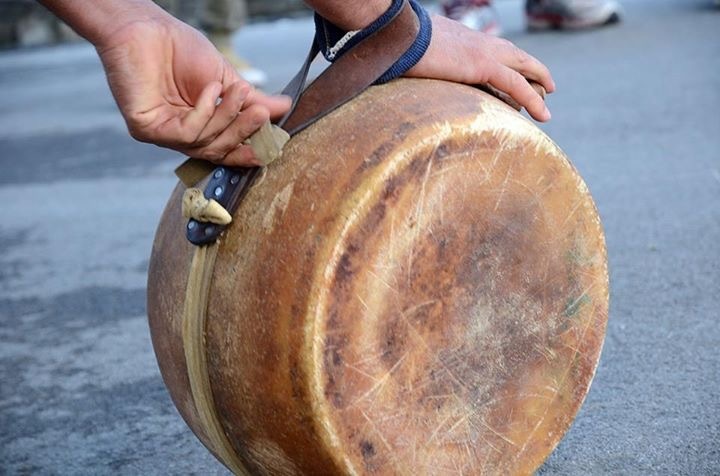 Watch the locals play the ancient sport of Tirra della Forma at the sporting ground below the villa on Sunday afternoons. We guarantee you have never seen anything quite like it. 11. 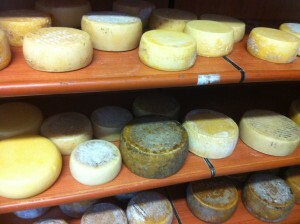 Visit the small cheese factory at Vibbiana, 5 minutes away. 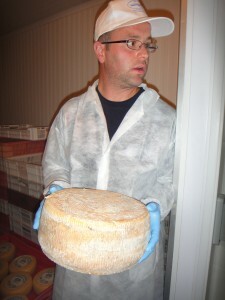 Ask Fabrizio to show you around, you may help make the cheese. Sample some, buy some, its the cheapest in town. 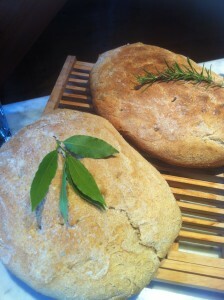 Eat it with some home made bread. If I can make it, you can!